10 years ago I was released from the hospital. 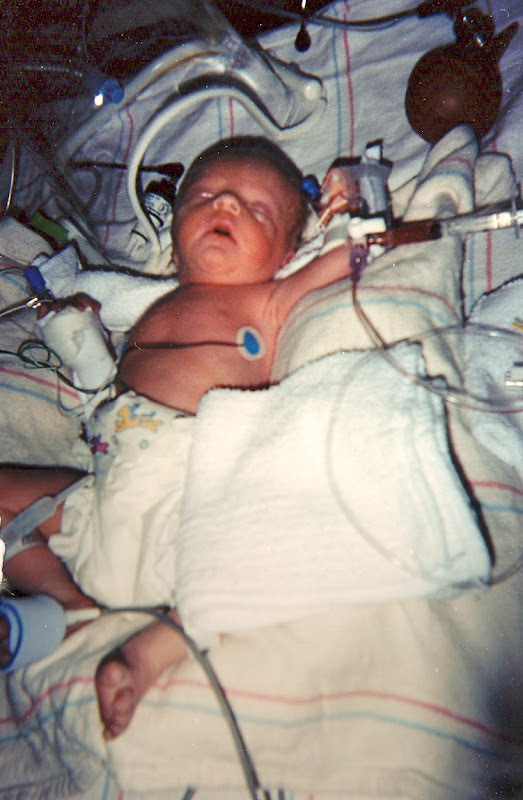 I had an emergency c-section four days earlier and had physically recovered enough to be sent home. My daughters, on the other hand, weighed less than five lbs, were seven weeks early and could not eat without a feeding tube. They had picc lines and heart monitors. They were weighed before and after every feeding. When I tried to breast feed them, their caloric output was more than the input - they exerted more energy than they were getting out of the feeding. I then made the choice to just pump. It hurt too much to see them lose weight after an hour's worth of nursing. They had iron shots every other day and a plethora of medications for reflux (yet another issue with weight...what they took in, they often couldn't keep down). They stayed in the hospital for another 23 days. I stood over their cribs that night...the night I went home without them...and sobbed. I sobbed big tears, my shoulders shaking, gasping for breath. I wouldn't be down the hall from them anymore and the hurt was unimaginable. I always knew that there was a good chance that they could come early. I had thought through the c-section, what that would mean for my recovery... I had thought through what it would be like having two babies to take care of...I had not thought through the fact that I would have to leave them. In the hospital. That I would go home without them. I had not thought through walking through the front doors of ARMC without them. It's ten years later and thinking about that still hurts. Even though I know that everything worked out for the best, I still find myself wiping away the tears. It was such a hard time...I was so young...they were so little...I wasn't in a very stable relationship...most days I felt like I was on a raft in the middle of the ocean. It's true what I said about those NICU nurses the other day...they were amazing...Mindy, Ben, Laura, Bev...I don't know how I would have made it through those dark days without them...without knowing that they were the ones taking care of my babies...without them teaching me how to take care of my babies. But it is ten years later and my life - and theirs - is so much better. So much better than I ever thought that it could be. Powerful, Angie. You know we blog so much about the present that it's special to hear about the things in life (even the struggles) that happened before we all got to "know" each other through blogging. It gives insight to what makes us the people we are today. Thanks for sharing this. Beautifully moving, thanks for sharing. I pray this will help others who have to go through this. So thankful that the outcome worked out so well for you. They were and still are 2 precious little miracles. They are growing up to be lovely young ladies. It's so amazing to witness and to have been there since the beginning. Oh, ANG. Hugs. Many many hugs. Love my girls.... all 3 of you! Can't wait to see you. Gosh, I remember watching you guys through that time! You handled it all with the true grace and wisdom of a mother. One whom I looked up to then and still do today. I miss you guys!